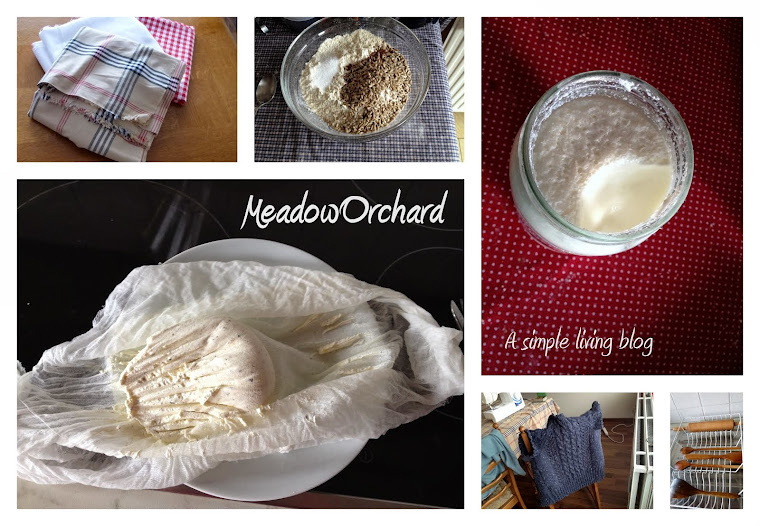 I spend a fair bit of time procrastinating and one of my favourite procrastinating activities is delving into the archives of simple living/slow living/crafting blogs. I love love love the thoughtful meditations, the sharing of oh-crap stories and oops stories, and of course most of all the lovely pictures of homes and traditional crafts and creativity and natural materials weathered through use and care. The pictures on my blog sometimes show glimpses of this, but there's so much imperfection in the background - the IKEA furniture filling the gaps amid the second-hand finds; the clutter; the plastic tubs that I so want to replace with earthenware pottery etc etc. (See the clearly terribly messy cupboard top below). However, going right back to the earliest archives does help - it looks not far off where I am now, which suggests that a home filled with natural materials and handmade or antique treasures is definitely achievable. For now, I reckon most people reading these blogs have the same reaction and they should be taken as inspiration rather than example.